This entry was posted in Jeux de mes amis - Games by friends and tagged Cards Against Humanity, Politique - Politics by Bruno. Bookmark the permalink. I agree that the game’s offensive nature is not a real problem, I think Shut Up and Sit Down missed the mark. I think the game isn’t very good, but for mechanic reasons. I think that first of all they stole Apples to Apples (if someone release Mascarade with their own roles, you wouldn’t appreciate it) but they also made it worse. Apples to Apples at least had some thought to the humour, because there’s just one word on each card. In Cards Against Humanity the punchline is already written. You could take black cards out randomly and people would laugh the same as if you had carefully selected it. The whole joke is the fact that it’s offensive. It reminds me of a child who hears a crude joke, and then they just say crude things to be funny. The joke was funny in context, you can’t just say a bad word and get the same laughs. CaH is funny once, but after that it’s boring. I’d rather play any other game. But then again, I don’t drink, so I’m probably not the target audience. But yea, I definitely agree that the accusations of racism, sexism, etc were misplaced and over sensitive. The game has plenty of problems, and those issues aren’t why I read SU&SD- they’re board game reviewers and I wish they’d stick to that aspect. Neither one is about “political consciousness,” really. Both are just toolkits for the type of satire that sells, the “let’s just plop this awful thing here and let people laugh at it because they know it’s so wrong” approach. It’s not “consciousness” or catharsis. It’s just lazy design. So if a prominent reviewer takes the design to task for pretty much being what it is, I don’t really understand the problem. Personally, what I think is missing in the design is a next step that something like Hotline Miami decided to take. It flat out asked the player “so hey, uhm, why do you like to play stuff like this?” I would be interested in a CAH game where players had to come up with equally crass jokes but had to either sign those jokes or take a vote on who they thought came up with it. It wouldn’t be Apples to Apples country anymore would it? Cards against humanity doesn’t need to be defended if the only goal of its designers was to make money. I might be wrong, but my feeling is that they had a real satiric, and probably political, intent, and I think they didn’t fail at it, although they might have been carried away by commercial success. 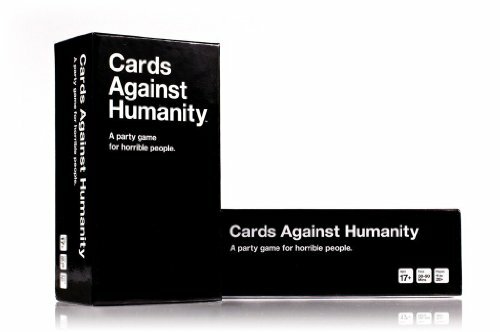 What you suggest as other games is interesting on paper, but probably wouldn’t work as a social experiment like CaH does, because it would require too much detachment from players. 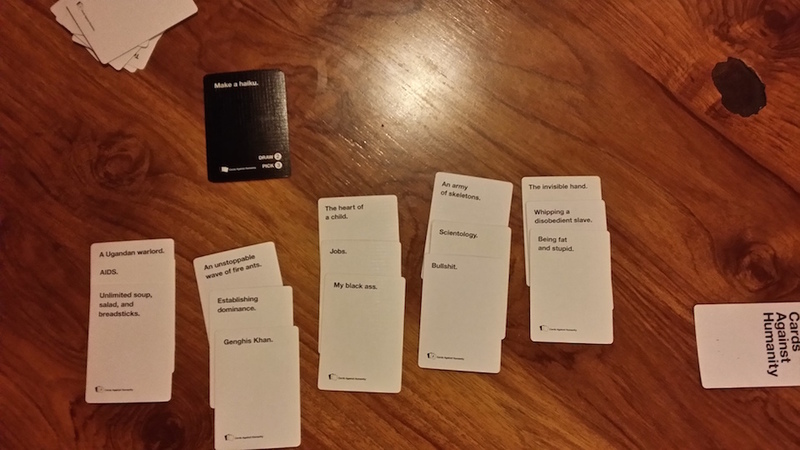 I really thinks that Cards Against Humanity is much more intelligent and positive than it looks.